Released of a new Springer book with the Proceedings of the 12th International Conference on Broad-Band Wireless Computing, Communication and Applications (BWCCA–2017) edited by SMARTLEARN members. 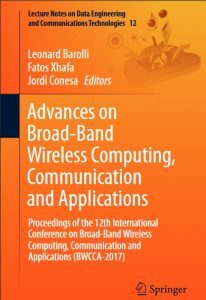 This book gathers the Proceedings of the 12th International Conference on Broad-Band Wireless Computing, Communication and Applications, held on November 8–10, 2017 in Barcelona, Spain. Information networking is currently undergoing a rapid evolution. Different kinds of networks with different characteristics are emerging and being integrated in heterogeneous networks. As a result, there are many interconnected problems that can occur at different levels of the hardware and software design of communicating entities and communication networks. These networks are expected to manage increasing usage demand, provide support for a significant number of services, guarantee Quality of Service (QoS), and optimize the use of network resources. The aim of this book is to provide the latest findings, methods and development techniques from both theoretical and practical perspectives regarding the emerging areas of broad-band and wireless computing. Barolli, L., Xhafa, F., Conesa, J. (Eds.) (2017). Advances on Broad-Band Wireless Computing, Communication and Applications. Lecture Notes on Data Engineering and Communications Technologies. Volume 12. 898 pp. Cham, Switzerland: Springer. ISBN 978-3-319-69810-6.